My favorite beef stew recipe is my "5-hour stew" recipe that I got from an older lady I use to work with years and years ago. I will post that later in the season. But when I saw this recipe in Southern Living Magazine (I modified it) last month, I had to give it a whirl. 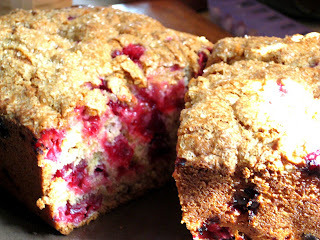 Cranberries and Beef together? You can't go wrong. 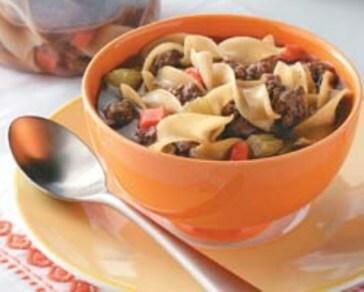 Plus I'm a firm believer that everyone should have more than one beef stew recipe with different flavors and styles. After all, we have a long cold winter ahead of us, so we need all the help we can get for comfort food recipes. Plus, it doesn't hurt that I now have 4 bags of fresh cranberries in my fridge because I plan on passing out that Cranberry Bread I posted last week to some relatives this week at a family birthday party. Before I make any kind of beef stew, I always marinate the stew meat. I have made and have eaten beef stew, where the meat was like rubber. This is just a simple little prequel to make sure your beef is "cut with a fork" tender. It's your choice but it doesn't take much time, and it's well worth it. 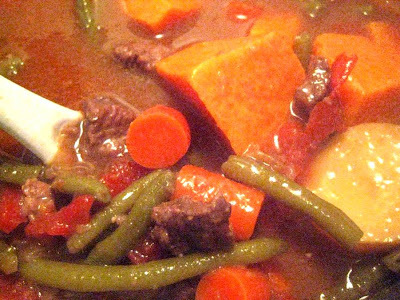 Several hours, or the day before, put your stew meat in a container that has a lid. Sprinkle McCormick's Montreal Seasoning mix all over it. Then sprinkle your meat with Worcestershire sauce. Don't be afraid, toss your meat all round, and shake the sauce so that every little piece gets some on it. Cover and let marinate in the fridge for a couple hours or overnight is best. Fast forward. Now we are ready to make our stew. Take a large storage baggie and put in a cup of flour. Take your meat, shake off any excess Worcestershire and toss the stew meat in the flour so it will gently coat each piece. In large Dutch oven, melt 1/2 stick of butter oh medium high heat. Once the butter is melted and the pan nice and hot, toss in the stew meat. Sear meat gently on all sides. Toss in the onion and garlic. Continue to cook until onion is almost cooked through. Add red wine, beef broth,water, thyme, can of diced tomatoes and fresh cranberries. Bring to a boil. 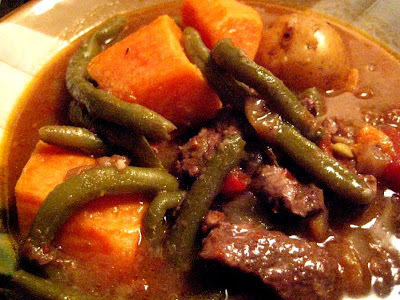 Stir in carrots, Yukon gold potatoes, sweet potatoes and green beans. Cover and set to low. Let simmer for 2 hours. Now is the time to do a taste test. Give your meat a little sample taste to see if it's tender. 2 hours should be enough time, but it depends on how low you have had your stove turned on. If it's just not quite tender enough, let it cook another 20 minutes or so. The broth is really yummy since it has the red wine, beef broth and cranberries, so you want to be sure to have some good bread to dunk into and sop up all the goodness that's left in the bowl. Click On Me To Print Recipe! New Uses for Old Things...Why didn't I think of that? I love it when magazine articles show brilliant ideas for things that I should have thought of! Makes me just shake my head, so simple, why on earth didn't I think of that! Here are some pretty spiffy ideas that you may or may not have already thought of. I know I didn't. 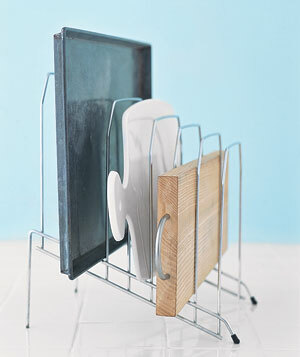 A clever way to re-purpose an everyday item! An empty Ketchup bottle! Portion pancake batter with precision! Now that's what I'm talking about. Perfect silver dollar, or mickey mouse pancakes every time. 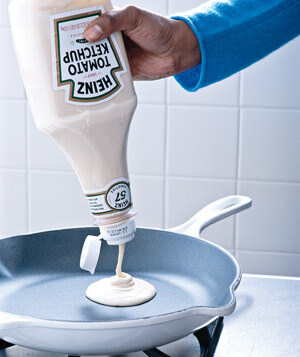 What they don't tell you is how you actually pour the batter into the ketchup bottle, but if anyone has a great idea on how do to that, let me know. I always wondered what guests did with their used appetizer toothpicks. Sometimes I find them a week later after I've had a party, laying all over hither and yon. Once I found one stuck in one of my house plants! 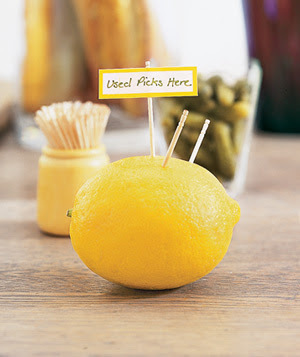 This trusty little lemon will tell your guests just what to do with that toothpick after they just poked it in a meatball and gobbled it up. Cute idea! Brilliant! Boy, I can't tell you how many birthday parties I've hosted, and when it comes time for cake and ice cream, all the guests are standing around waiting patiently for their slice of cake and their scoop of ice cream. There I stand, trying to scoop out the ice cream, one by one on each plate, trying my hardest not to drip and mess up the whole table. Perfect Solution! 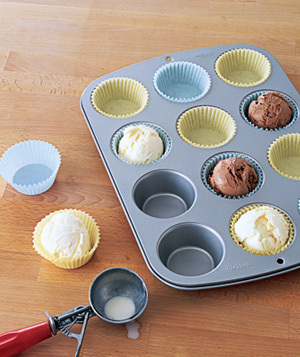 Scoop out the ice cream the day before and freeze the scoops in the cupcake liners. The day of the party, bring out a nice serving tray holding all the perfectly scooped ice cream in their neat little holders. Plop one down on each of cake plate. No fuss, no mess and NO DRIPPY ICE CREAM! I'm all about making less to-do for the hostess on the actual day of the party. After all, a hostess should be able to enjoy her own party too. I think this is my new favorite brilliant idea! I can't tell you how many times I've had a poker party, or a movie night with friends, and I wanted to pass out popcorn or some home-made chex mix, and went crazy in the kitchen looking for 6 or 8 little bowls so each person could have their own personal snack container. If you play cards or board games with friends, this is a PERFECT solution so each person can have their own little holder for whatever snack they choose to munch on. Love this one! If you have a fire pit or a chiminea like I do, it's always a bit of a pain to get that thing started. If you have wine corks like I do....and man do I have lots and lots of old wine corks, then your problems are solved. Get a blaze crackling faster. 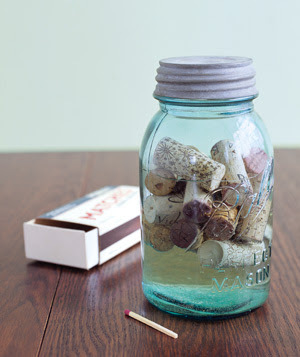 Keep wine corks in rubbing alcohol in a sealed jar (stored away from the fire of course). Just before lighting a fire, toss a few corks under the kindling! Wow, instant MacGyver! I have loads of cookie sheets, all sizes....cutting boards......jelly roll pans, you name it, they are all stacked up, one on top of the other under my oven. This is a Desk Organizer for your files.....why on earth didn't I think of this? Now off I to to get my life more organized. Pan Seared Tilapia with Secret Ingredient ! Forever I was afraid to make fish at home. It never even crossed my mind to give it a try. I was petrified of trying it. Heck I didn't even know what kind of fish to buy and where to buy it. Cod? Halibut? Bass? I literally had no idea what to get. All I knew was I think frozen fish sticks and McDonald's fish sandwiches were Cod. Come to find out, I guess they aren't even Cod anymore, but that's another story all together. Tilapia is my fish of choice. It's buttery and flaky and has NO fishy taste. 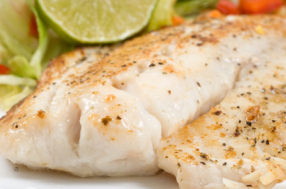 Pan-Seared Tilapia is how I started making fish at home and it's the easiest way to get your feet wet in cooking fish. Just searing it on both sides in a hot skillet with Olive oil or Butter. Simple. First of all, I always get my Tilapia in the freezer section of my grocery store. You can buy a bag that has either 4 fillets or 8. They are each individually wrapped so it's easy to just take out 2 or 4 at a time and thaw them on an as needed basis. Sometimes they have frozen Tilapia that already is coated with a rub or marinade.......forget it...... just get the plain! Located in the spice section. Normally on the bottom shelf. Most grocery stores have it because I just went to Denver, and they had it there too, so I'm guessing its pretty popular. Be sure to get the one with the yellow border. They have another kind, I think it's low salt or something, but the yellow border is the best. Ok so here you go, don't be afraid. Thaw your fish fillets. In the fridge is good (overnight), or you can lay them frozen in a large bowl (still in their wrapper) and cover with cold water. They should thaw in about an hour or less (this is what I always do). When thawed, take them out of their individual packages. Pat them dry with a paper towel and lay them on a large plate or platter. 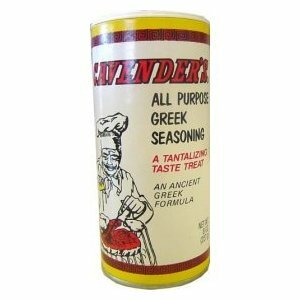 Gently sprinkle Cavenders Greek Seasoning on ONE side of the fillet. DON'T over do it because this stuff can be pretty strong, so just gently sprinkle on one side. Take out your skillet. Cover the bottom with Olive Oil (be generous) and turn the heat up to #8 for you electric folks or if you have gas, I would say Medium High. Get the skillet nice and hot and then gently lay the fish in the hot oil, seasoned side down. When you put the fish in the skillet, it should not start to splatter like crazy, but just gently sizzle. Fry on the first side 3 to 4 minutes. You will start to see the sides of the fish turn white. That's a good hint on when to flip over. Flip the fillet and fry another 3 to 4 minutes. These guys are pretty thin and really don't need to be cooked too long. Plus...OVER COOKED FISH TASTES LIKE RUBBER! It's true! That is the one reason why people don't cook fish at home. They tried it once......cooked it too long........ it turned out like silly putty....... and then never attempted it again. So basically 3 to 4 minutes on each side should do it at medium high heat. Now isn't that beautiful? So flaky. So buttery tasting. So good for ya! 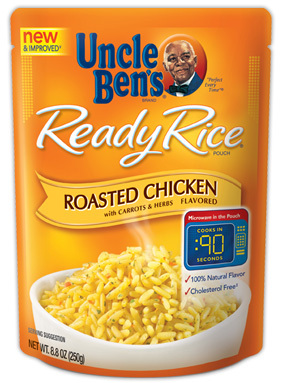 Uncle Ben's has the BEST 90 second Microwavable rice that goes perfect with your fish. Good ole Uncle Ben has about 10 or more "Ready Rice" flavors. All of them take 90 seconds in the microwave! Seriously. I think I've tried literally all the flavors. They don't disappoint! Here are just a few, they are ALL GOOD. So pan-sear 3 to 4 minutes on one side................3 to 4 minutes on the other side......90 seconds for your rice......think about it........... In 10 minutes voila! Be afraid no more, Tilapia awaits! I found this recipe on the internet 4 years ago. I printed it out, and didn't make them until 2 years later! I took one bite and wondered why I had waited so long! This recipe (I modified it of course) went straight into my recipe binder. It's one of my favorites. Technically I guess these are not "enchiladas" but more like burritos since you use flour tortillas, and there isn't any enchilada sauce on them. So you can call them what you want. Sometimes I say I'm making "White Chicken Burritos" and sometimes I say "White Chicken Enchiladas". Either way, my hubby and daughter know what they are, and they ask for them by different names too! Preheat over to 350. Lightly grease a 9 x 13 baking dish. Open can of black beans, and empty into strainer. Strain all the blackish juice and rinse them under cool water to remove all the black bean juice. You don't want the filling to be all black and icky. Set these aside until later. In saucepan over medium heat, combine cream cheese, and salsa. Stir frequenly until almost melted. Add frozen corn, chicken and beans (I actually don't use the entire can of beans. I find that it's a bit too many so I use only 3/4 of the can). Continue to stir and cook over medium heat until mixture is heated through. Spoon filling into the soft flour tortillas and roll them side by side in your pan like nice little soldiers. Normally my 9 x 13 inch pan will only hold 9 of the "filled" flour tortillas. You should have enough filling to perfectly fill 9 flour tortillas (soft taco size). If you are creative and can squish them together, you might be able to get all 10 tortillas in your pan. But I don't like to be squished. Cover the burritos/enchiladas with the shredded Monterrey Jack cheese. Cover with aluminum foil. Bake for about 20 minutes or until heated through. When you take off the foil, you should see the wonderful white cheese all melted and gooey to perfection. You can take the foil off and bake for another 4 to 5 minutes if it looks like the cheese might need to be melted a little more. Now for the topping. I really really RECOMMEND this. There is something about the cool crispness of the shredded lettuce and tomatoes along with the melted yummy-ness of the filling that make this go from good to GOODER! (Not a word I know). 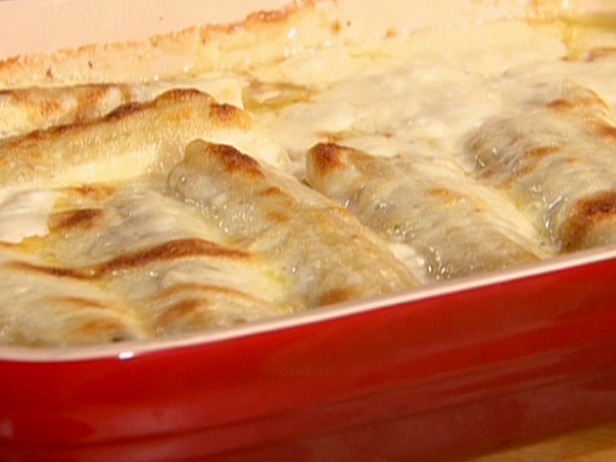 Now.... dish out one of the white enchiladas on a plate. 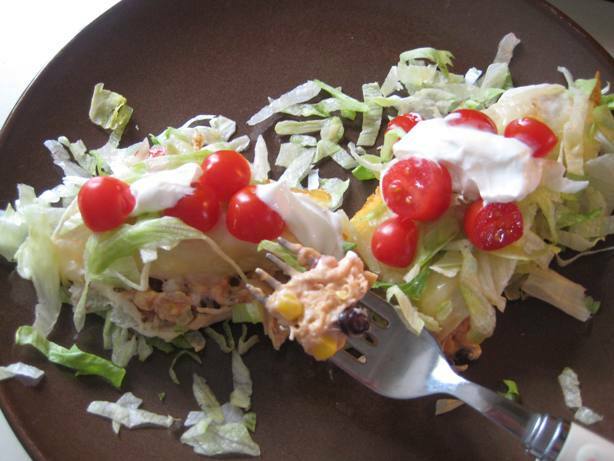 Sprinkle the top with shredded lettuce, diced tomatoes, and now for the finishing touch........drizzle sour cream all the way down this baby. Please don't leave this last step out. If you refuse to do this, then just don't make this recipe. I mean honestly. What looks better? Naked enchiladas below? Serve with Rice and Tortilla Chips. I have a friend who loves to bake. I use to work with him and every Friday he would bring in a baked good for a TGIF treat. He has given me loads of his recipes over the years, including his Pumpkin Bars with Cream Cheese Frosting. I have been making them every Fall since 1996. I know that because I still have the email he sent me with his recipe, dated 1996. So basically every Fall, for about 14 years, I've made his pumpkin bars. Faithfully, loving them each and every time. But just about every other year, without fail...........I am unfaithful. There is always some Pumpkin Bar recipe that lures me in......like a home wrecker.........and every year, I fall for it. I cheat on my friend's pumpkin bars. Some home wrecker will have a recipe on TV that I "think" I have to try.....or some October issue magazine will have a glorious picture of pumpkin muffins or a pumpkin cake, that lures me in. I guess the grass seems greener on the other side. But trust me. It's NOT! Take my word for it, this is the best PUMPKIN recipe that I have tried in the past 14 years. Yes I have been unfaithful. But every year, these loving bars have always been faithful to me. I will never stray again. Please note: I always make these in a Jelly Roll Pan. 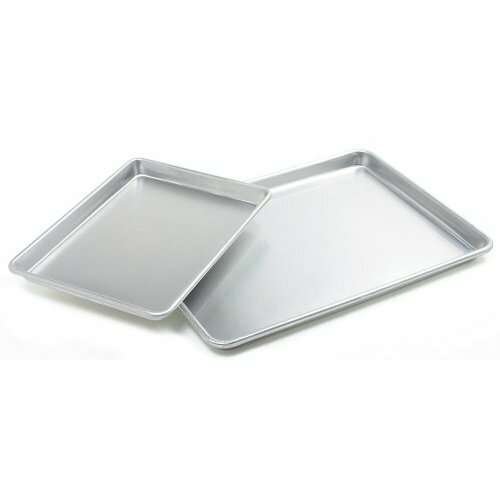 Some call it a quarter-sheet cake pan. 12 x 17 with only a 1 inch high side. This makes the bars thinner and much easier to bake. This is my favorite pan for baking. I rarely use a 9 x 13 pan anymore. See how the sides are low. It just makes it cook evenly and creates bars that are not so thick. Just a personal preference. In large mixing bowl, cream oil, eggs, and sugar. Add the pumpkin baking soda, salt, baking powder, cinnamon, and flour. Mix well. Pour into greased jelly roll pan. Bake at 350 for 20 to 25 minutes or until toothpick comes out clean when inserted in center. Cream together cream cheese, butter and vanilla until smooth. Gradually add powdered sugar, mixing well after each addition. 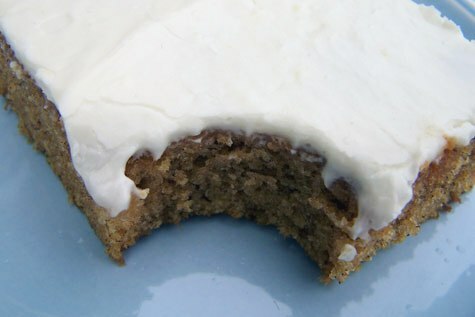 If frosting is too thick, slowly add a touch of milk to desired consistency. Be sure to store these babies in the refrigerator! I've been called Evil becauase of this. Out and out, finger in my face, Evil. That's what I was called after giving this recipe to a friend and she tried it the very next day. Thanks Diana! 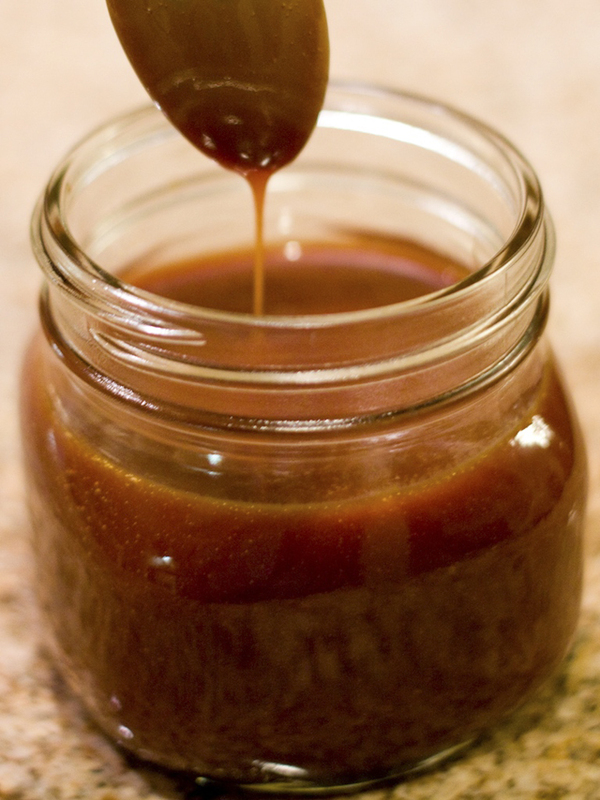 I've heard the cooks on TV mention over the years.... "You could use the store-bought caramel sauce, but there is nothing like making your own". I would snicker "yea, yea, what a pain though. Forget it". Well what a fool I've been for all these years. It's NOT a pain, and they are right....there is nothing like making your own. I guess that's why they have their own TV show and I don't. If you want to be called Evil....I suggest you make this right away before Halloween is over. Otherwise you will be called Evil during Christmas, and that just ain't good. You can make this delicious bit of heaven and put it in plastic containers or jars, and give them as a gift with some Honey Crisp Apples, or a container of Vanilla Ice Cream. You will be the most loved Evil person on your block. Mix together honey and butter and sugar in saucepan. Turn on med. high heat while stirring constantly. Bring the mixture to rolling bubbling boil for 2 minutes while continuing to stir constantly. Add condensed milk and mix well, keeping the stirring and heat constant until completely mixed through. Store in airtight containers in the fridge. To warm up, use microwave on a low setting. Say what? You read it right. White Chocolate, Peanut Butter & Popcorn! Probably the most addictive snack you could possibly make. 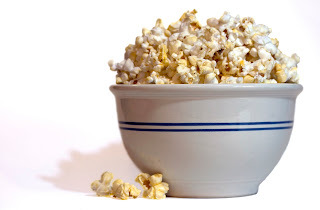 Poker Snack, Gift-Giving Snack, Movie Night Snack, Addictive Snack! This is my mother-in-laws recipe and it's a real keeper, so write it down ladies! Melt white chocolate and peanut butter in saucepan over medium heat, stirring constantly. 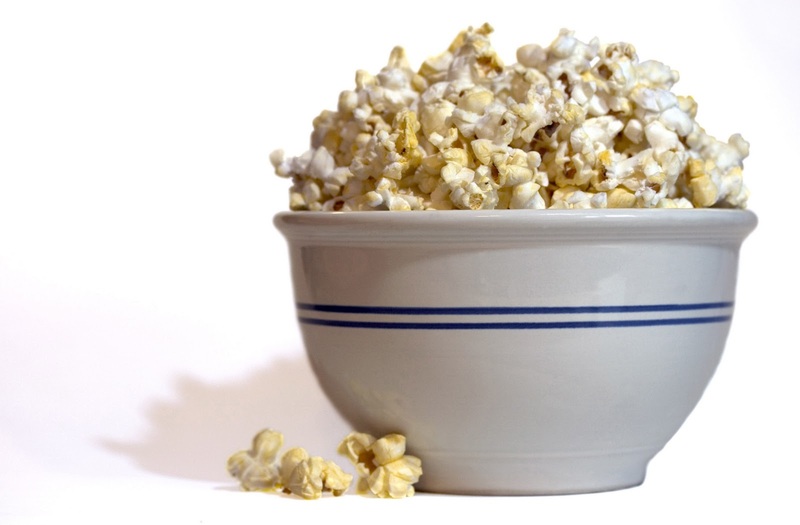 In large bowl, combine popcorn, Rice Krispies and dry roasted peanuts. 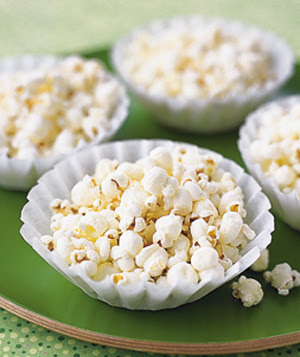 When white chocolate and peanut butter have melted, pour over popcorn mixture. Toss completely! Spray large cookie sheet or sheet cake pan with Pam. Spread out mixture and let cool. Enjoy. I'm not alone I know it, but I just LOVE the month of October. Living in the Midwest, it's probably the best time of year. 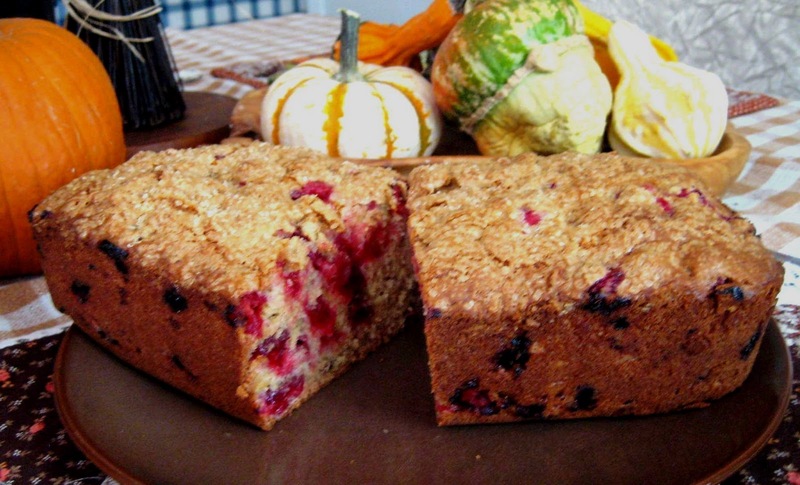 Football, Crisp Cool Weather (A welcome to the terribly hot month of August), Flannel Shirts, Scarves, and of course, Fall Cooking. October is probably the one time when people just throw diets out the window. Afterall, we need to pack on a few pounds and get ready to hunker down for a long cold winter. I love this gal, The Pioneer Woman. Her recipes are great, simple, and she's just awesome over-all. I mean who does not want to immediately start stuffing your face with this? 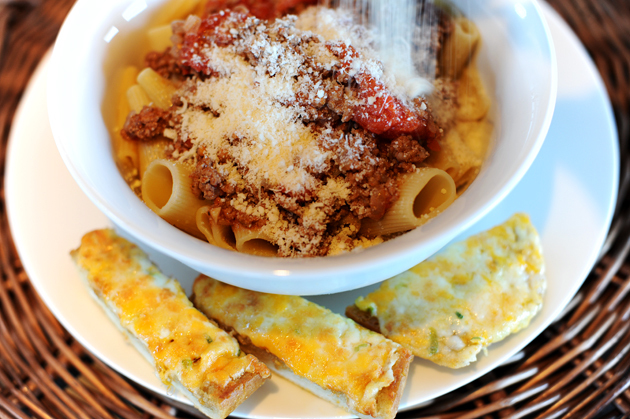 Pasta Alla Marlboro Man is her recipe, and trust me when she tells you, it will get you a marriage proposal. Go here now! Welcome Fall/October with open arms!